Friday I was tired… very tired. A rest was overdue even though I have done less than four hours training this week. All training was pretty intense. Last night I broke my rest with a 1×20 Turbo set. After failing this set on Wednesday I was not looking forward to it. It turned out to be pretty manageable; not exactly easy, but I didn’t feel too shelled afterwards. This morning -first thing- I was out on the XC Skis for a beautiful, sunny and solid 13km. 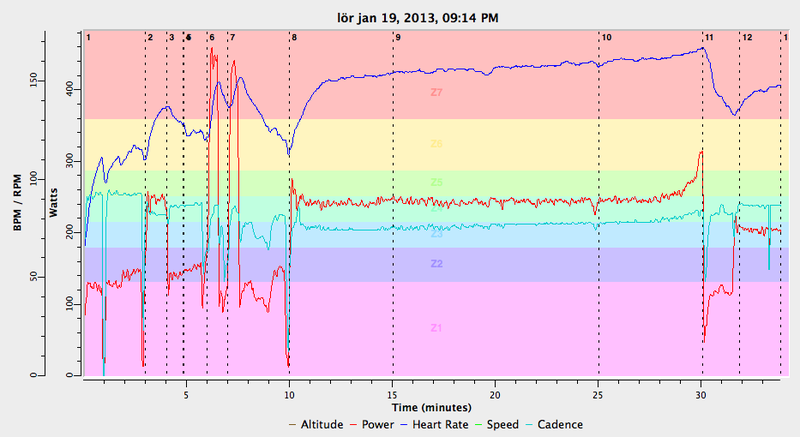 Average HR was 150bpm which tells me that my technique was not stopping me from putting an honest effort in. First ski of the year and most definitely not the last. Time will now tell how I’ll recover from a difficult 12 hours.